KsPrism heavy-duty aluminium mop, brush and broom handles are manufactured from 25mm top quality rolled tubing, 1.5mm thick and side-welded for ultimate strength. All exposed aluminium is anodised for a permanent high shine and hygiene-friendly finish. Reduce wrist fatigue and improve operator performance by using ergo or one-piece handles with increased emphasis on how operatives grip the handle. For those far-reaching applications, KsPrism extending telescopic handles can reach as far as 9.5 metres! All handles are food-contact-approved and available in a number of sizes, and in up to 11 KsPrism colours, including grey, brown and pink. 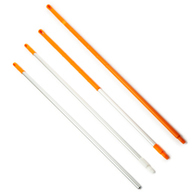 Whether for mops, brooms, brushes or squeegees, these aluminium-and-plastic handles have been designed to withstand ongoing and heavy use in a wide range of food preparation and other environments where hygiene is of paramount importance. 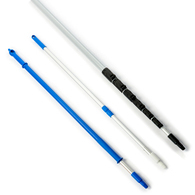 KsPrism regular and telescoping commercial handles use universal threads and are fully interchangeable between utensils. Browse the range below.